Congresswoman-elect Abby Finkenauer says she’s interested in serving on the Energy and Commerce Committee after she’s sworn into office in January. Finkenauer, a Democrat from Dubuque, finished about 16,000 vots ahead of Republican first district Congressman Rod Blum in Tuesday’s election. She’ll be sworn into office in early January. Finkenauer plans to schedule town hall meetings in the district. 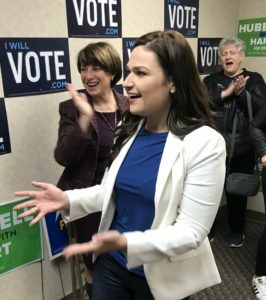 Finkenauer, along with Congresswoman-elect Cindy Axne of West Des Moines, are the first women Iowa voters have sent to serve in the U.S. House. Finkenauer says government works best when all voices are heard. A record 45 women will serve in the state legislature in January. At the federal level, Finkenauer is among at least 98 women who won seats in the U.S. House. Finkenauer made her comments today during an interview with Radio Iowa.